The Battle Of The CC+ Creams. I think you can assume that I loved IT Cosmetics Your Skin But Better CC+ Cream so much I went and bought Oil-Free Matte version straight after I had finished the previous one. If that ain't love, I don't know what is. Or should I say; if that's not combination skin, I don't know what is... hmm. Don't get me wrong, I did wonder what the difference was before I purchased it.. Well, £30 is a lot to drop on something you aren't entirely sure on. I had heard a couple of good reviews, so I just thought why not? That's good enough for me I guess. But believe me lessons have been learnt in the past! I am not new to a dud recommended product.. or 10. I always try to find either a travel sized version. Either that or I go into store and ask for a sample or a trial there and then. Anyway, being brutally honest, there wasn't a whole lot of difference at all. The shades are pretty similar, I went for 'Fair' since that is what I have previously worn and it definitely looked the same. The only real difference I noticed was the consistency when applying it. (FYI: I applied it using the Real Techniques Miracle Complexion Sponge) I panicked at first because I thought that it would set cakey, but it didn't. I also noticed it had a lot better coverage, not that that was my main reason for purchasing it in the first place. My original aim was not to have to touch up my t-zone so much during the day. Simples. However, saying that, another thing I noticed was that I couldn't wear my usual moisturiser around my under eye area. It seemed to have a tendency to stick to the moisturiser and make my skin look even drier than ever. Nightmare. So, I started to use Too Faced Hangover Primer in a hope that it would balance out my dry patches to my more oilier ones. The jury is still out. In conclusion, I really like IT Cosmetics Your Skin But Better CC+ Oil-Free Matte with SPF 40 but for the price and the amount of coverage it offers I think I will just stick to my Revlon Colorstay foundation. The two products are very similar if you are wondering, with Revlon being a third of the price. 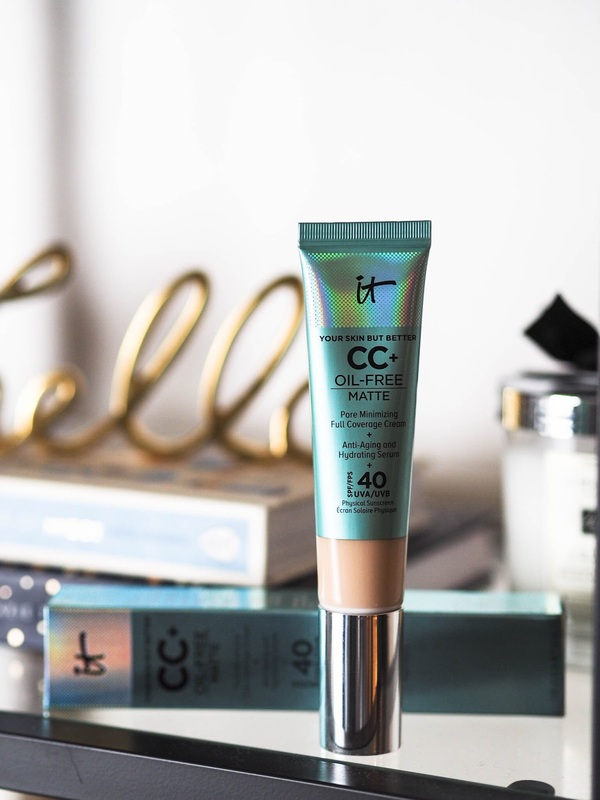 I think if I was going to splurge again I would repurchase the original CC+ Cream. I just preferred it? I have also recently tried IT Cosmetics Bye Bye Under Eye Illumination - if you read my post on my winter beauty favourites you will know under eye dryness is something I battle with on a daily basis. I was destroyed that this didn't work for me. In fact it was probably the worst concealer I have tried in a long time. As part of my very short consultation at the IT Cosmetics counter I tried the IT Cosmetics Your Skin But Better™ CC+ Cream Illumination too, I got some serious glow going on, but coverage was kinda poor and after about an hour of wear I was suffering some serious oil damage. The woes of combination skin strike again.